Brookgreen Gardens features the only known aviary built atop an actual cypress swamp. Here you can enjoy a leisurely stroll on the boardwalk while watching magnificent birds feeding and flying in a natural setting: great blue herons, black-crowned night herons, egrets, hooded merganser, white ibis, redhead and wood ducks. Free with general admission ($12 adults, $10 seniors, $6 children 4-12), which is good for 7 consecutive days. Great blue herons live along coastlines, in marshes, and near the shores of ponds and streams. They are expert fishers. Herons stand still for long periods of time waiting for fish to come near their sharp bills. They kill their prey with a quick thrust and then swallow it whole. Some have been known to choke to death attempting to swallow fish too large for their S-shaped necks! 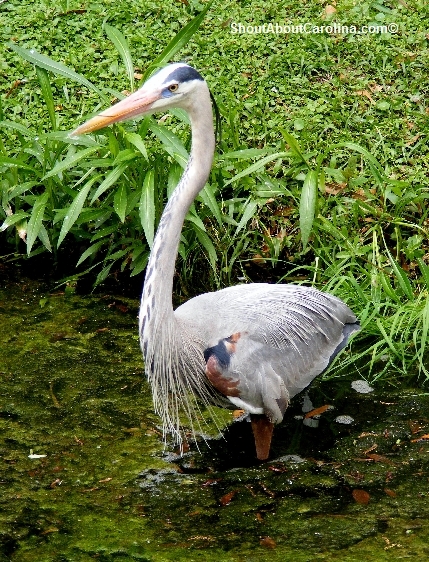 The great blue is the largest heron in North America with an average wingspan of 6 feet. They can cruise at some 20 to 30 miles an hour. Though great blue herons hunt alone, they typically nest in colonies. Females produce two to seven eggs, which both parents protect and incubate. Chicks can survive on their own at two months of age. Blue herons are very sensitive to human intrusion and will often abandon the nest if disturbed. Great egrets are found near water and feed in wetlands, streams, ponds, tidal flats, and other areas. They mainly feeds on fish but can also eat frogs, snakes and small mammals. 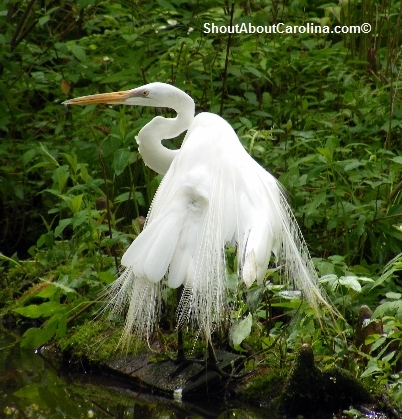 Great egrets nest in trees, near water and gather in colonies. They are monogamous, and both parents incubate their three to four eggs. Young egrets are aggressive towards one another in the nest, and stronger siblings often kill the weaker chicks. Did you know? The great egret is the symbol of the National Audubon Society. During much of 19th century they were almost completely wiped out, being hunted for their magnificent white feathers. Today, the great egrets population has recovered significantly while under legal protection for more than a century. 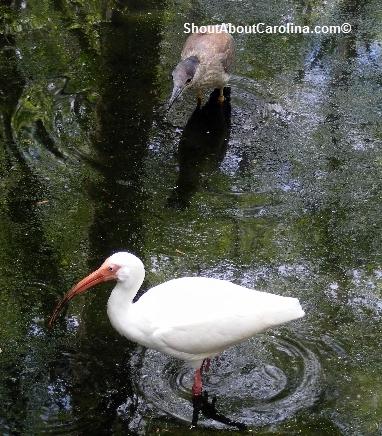 The white ibis has reddish beak and legs. It wades in shallow water feeding on crabs and crustaceans. The white ibis lives in huge colonies, some as large as 50,000 birds! Nests are built by both parents with materials usually stolen from other birds’ nests. The male brings the materials while the female is the one constructing the nest. The young are cared for by both parents until fledged, at about 4 weeks of age. 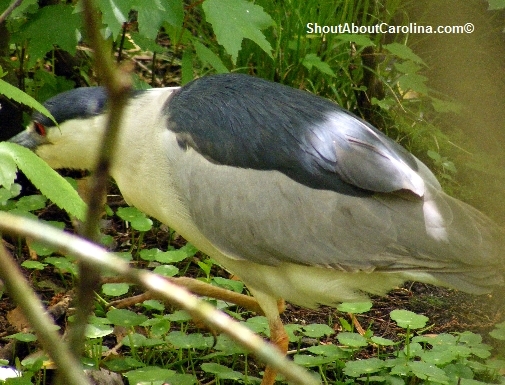 The black crowned night heron is one of the most common herons in the world. It can be found on every continent except Australia and Antarctica. They are short-legged and stocky birds that inhabit freshwater swamps and marshes. 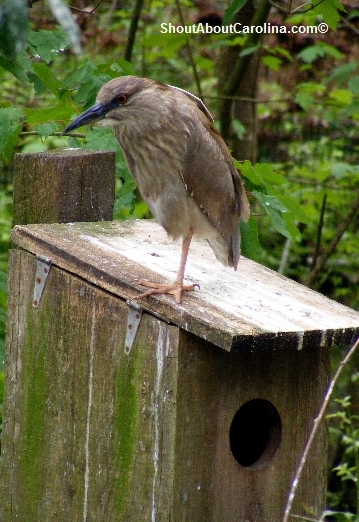 The black crowned night heron is mostly active at night. They feed on small fish, invertebrates, amphibians and mice. Like all herons, they are very social birds and live in colonies. This exhibit opened in 1977 and it was the first aviary habitat built on an actual cypress swamp. The tallest center poll is anchored 70 feet into the grounds and extends 90 feet into the air. The Cypress Aviary exhibit withstood many hurricanes including Hugo. 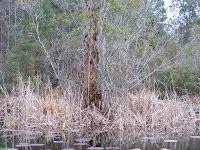 Swamps are forest wetlands. They act like a sponge, filtering pollutants out of the water. The water looks black because of tannins that come from decomposing plants and some plant roots. Waccamaw River which supplies water to this swamp is considered a “black water” river. The plants in swamps have special adaptations that enable them to tolerate high water levels. Some of the swamp trees featured in this exhibit include Tupelo, Gum, Red Maple and Bald Cypress. Make sure to see the rare farm animals and the daily live wildlife demonstration at the Lowcountry Center. Here is a list of fun activities kids can enjoy around Myrtle Beach for about $10 or less. I’m at the Cypress Gardens swamp park (30 minutes drive from Charleston). The boat pulls slowly towards the dock radiating a familiar big band tune. Nice, we’re getting radio too. Nope, that was Frank, the boat guide. Even better, we will be serenaded thru the flowered bordered black water swamp meanders. Along the way I learn that Frank, besides being a guide during visiting hours, is also the foreman, a jack of all trades maintenance guy. 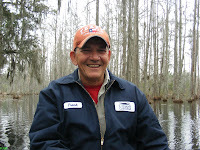 He takes care of every boat, does the electric, plumbing, carpentry and everything else under sun that’s required to keep things smooth at the swamp. 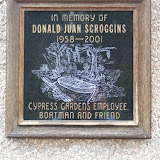 After spending 20 years working at the steel mill, being the foreman at Cypress Garden it’s “a lot of fun”. 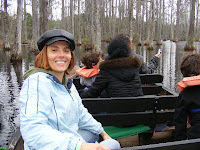 I, along with a family group that includes grandma, mom and two young boys, get settled in one of the flat bottom boats. These were made of California redwood wine casks in 1930’s at the request of Mr. Kittredge, the swamp owner we can now all thank for the privilege to enjoy this masterpiece. Frank tells us there are no flooding gate “‘cause the swamp was made as reservoir for the rice fields” at the Dean Hall Plantation in the 1700s. Rice was “Carolina’s Gold”, the main cash crop and undisputed queen of the Lowcountry that helped built most of Charleston’s beautiful townhouses, plantation homes and beach gateways, and even the furniture, like the city’s popular Thomas Elfe bed. “In my time, I only knew that you grow rice in China” says Frank with a wide smile. “Look at all the floating hearts!” yells Nathaniel, the energetic little boy next to me. The “hearts” are Atamasco lilies; Cypress Garden boasts the largest concentration in the Southeast thanks to a popular inter-bellum challenge that gave young boys a penny for every lily bulb they would scour from the woods. We are now in the middle of “Lizzie’s Garden” as Frank calls it fondly. You can tell he is very attached to the Kittredges. “These were good people, you know?…The day they built this garden they let everyone in to enjoy it…I mean everybody…like you and me…back then that was something special, you know?” Legend has it that Mr. Kittredge was mesmerized by a red maple tree striking reflection in the swamp’s famous black waters during one of his duck hunting trips. The rest is history and the garden was born. On our way back it starts raining. Frank points out two shooting scenes from Mel Gibson’s movie “The Patriot”. 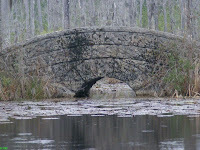 The bridge is where the militia was hiding waiting for the Red Coats; the island is the location for the “Old Spanish mission in the black water swamp”. As we are getting out Frank is cheering us up with the “I’ll be traveling down the mountain” song. He sounds just like Elvis. We shake hands. Just like his smile, his hands are warm and familiar. Despite the dark clouds and bone chilling rain I feel great. I waive Frank good bye one more time. He is special, you know? • The guided tour lasts about half an hour give or take depending on how voluble Frank (or the other guide) is. Boats leave every hour on top of the hour. Don’t worry if you’re not Michael Phelps type swimmer. The swamp is only 3 feet deep and yes you will be provided with life vests. • Unlike other swamps (i.e. Congaree National Park near Columbia) there are no mosquitoes at Cypress Garden, courtesy to the sap in the water that acts as a repellent. • You can “safely lose the kids” at the Butterfly House, Aquarium, Reptile Center, Crocodile Isle and Aviary, or at the small replica of an inland rice field. • There are 4 miles of walking paths and nature trails for outdoor enthusiasts. You should be on the lookout for alligators, the main animal attraction at the garden, although none will bother to venture out in the “freezing” 45 degrees winter temperature. Come May and is a whole different story; no “feeding or harassing” please. • Besides “The Patriot” there were other famous movies shot here, like “North and South”, “The Notebook”, and “The Yearling”. In fact the SC State Museum in downtown Columbia is featuring an incredible exhibition about all the Hollywood movies shot in South Carolina.